Mark Gertler, Merry-Go-Round, 1916. Tate Britain. Born in December 1891 in London, Gertler was the youngest child of Polish Jewish immigrants. In 1906, he enrolled in art classes at Regent Street Polytechnic, but due to the family’s poverty, he was forced to quit his studies and start working for a stained glass company – a job he disliked very much. After coming third in a national art competition in 1908, and obtaining a scholarship from the Jewish Education Aid Society, he enrolled at the Slade School of Art, University College, London. There, he got acquainted with Paul Nash, Edward Wadsworth, C.R.W. Nevinson, Stanley Spencer, Isaac Rosenberg, and Dora Carrington, whom he loved obsessively and pursued relentlessly for many years. Unfortunately, Carrington, deeply in love with the homosexual writer Lytton Strachey, never fully reciprocated his feelings. Lawrence used Gertler as well as Carrington as models for his characters in Women in Love. Certain traits of Carrington can be identified in Minette, and Loerke is partly based on Gertler. “But the way in which Lawrence transforms his attractive friend into the corrupt and sinister Loerke provides a valuable insight into his creative technique. 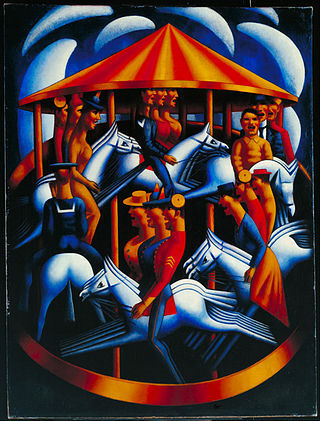 Merry-Go-Round provoked a highly emotional response from Lawrence, who did not separate the impact of the work itself from his feelings about Gertler as a person and an artist.” (Meyers). Lawrence’s fascination with Gertler was perhaps dictated by similarities of character and a background they both shared. “Volatile and exciting personalities, their lack of self-control, their tendency to be overbearing and possessive, to dominate and to wound their friends, are partly explained by their early poverty. For both men retained their regional accents and remained working-class outsiders in society, strongly attached to their families, especially their mothers, and always resentful of and uneasy with rich patrons.” (Meyers). Perhaps that is why Gertler and Lawrence were able to remain friends until Lawrence’s death in 1930, and even the episode of Lawrence’s maltreatment of Gertler in Women in Love did not affect their friendship. Van Gogh, Rothko, Gorky, even Pollock and Basquiat in their own way-what is it with painters and suicide? existential frustration of creative minds?